Moving walls and floors enable endless configurations of the space, the interior can adapt to spatial needs for different functions by shifting walls and floors where you need them. This allows the interior to be quickly adapted for changing programs. From day-care in the morning to dance event in the evening. Comfort is offered by making the room bigger or smaller, and efficiency is met through functional and flexible design. Through clever lifting and sliding technology, the changes in space formats can be made within minutes. Operating the interior is monkey-proof, safe, easy and fast with a push on the button. Visitors do not even have to leave the building when the interior moves to a new setting. This novel adaptation of space is user friendly and offers a unique experience. For Circl, the design firm made a strategy that contributes to a 'circular' and 'inclusive' economy. The interior is designed based on the minimal use of materials, material loss and technical handlings, using the intrinsic qualities of the homogenous materials, with only dry connections to enable disassembly and future reuse. Aesthetic qualities arise through an analytical process based on circular design principles. The final image does not simply refer to 1:1 reuse and recycling. A new, more timeless image is made through reuse and recycling. The design is not only focusing on aesthetic value and user experience, it has a positive social and environmental impact. The end users of the building were involved in the process and contributed by donating their old company uniforms for recycling into acoustic textile plaster for walls and ceilings. The integrated plants in the podia are cultivated and maintained by people with a distance to the labour market, thereby creating social value. The project involves end users, thus creating social return and adding social impact through its design. With the fast configurations of spatial use, new business models are spatially translated. 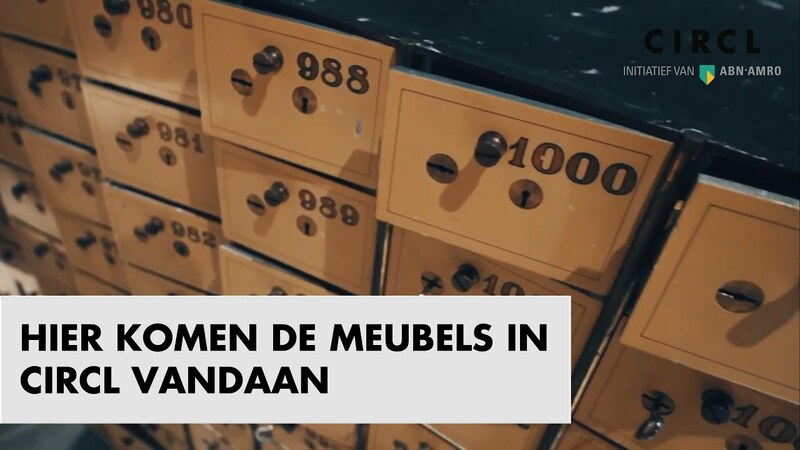 Another example for exploring with new economic models is with the object taken a service and the pavilion functioning as a second showroom for a vintage furniture supplier. In so doing the bank is using and not owning furniture, and the furnishings continue to vary as soon as objects are purchased by visitors. The pavilion is a showcase for the circular economy. 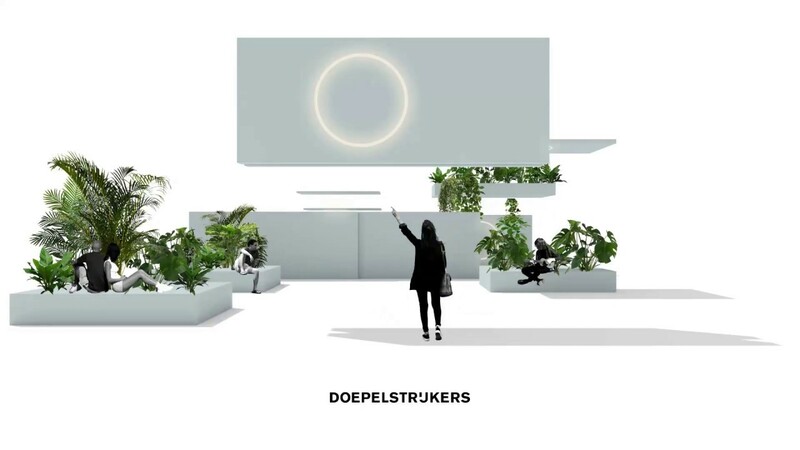 DoepelStrijkers plotted five research and design lines to show current possibilities for designing and building a circular interior. There are two lines in the design where the existing material offers the starting point, a supply-driven process. This concerns the first line 'reuse 1:1' in which materials or products are reused without any adjustments, the function remains unchanged, and the second line 'reuse + remanufacture' where products or product parts are reused, rebuild and combined with repaired and new parts into new objects with a new function changing its original specifications. Two other lines show solutions for a demand-driven process. The third line 'recycle' shows design by converting old materials into new materials and objects. The fourth line 'reusable' explores optimization of value retention in the design process. The last research and design line is 'object as a service', where ownership is dealt with in a different way. In this way the pavilion shows, as an arboretum of possibilities, the current state of play in sustainable design for finishes, fixed and loose objects and furnishings. "The challenge for us as an office lies in translating our sustainable ambition into objects and spaces that transcend the traditional image of sustainable design. We search for a spatial translation of sustainability criteria into an image that does not directly refer to reuse for example, but rather by incorporating the positive attributes of sustainable building principles into objects, spaces and buildings that reflect our contemporary design idiom.